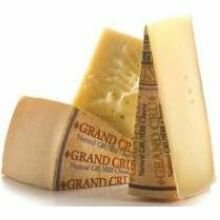 Roth Kase Grand Cru Reserve Gruyere Wheel Cheese, 18 Pound -- each. Roth Kases flagship cheese, this washed rind Alpine-style classic is crafted in the Swiss tradition and cured for six to eight months to create earthy and nutty undertones with a hint of fruitiness. If you have any questions about this product by Roth Kase, contact us by completing and submitting the form below. If you are looking for a specif part number, please include it with your message. Bellavitano Cuts Cheese, 1 Pound -- 10 per case. Roth Kase Cheese Board Kit Classic Selection, 2.5 Pound -- 5 per case. Grand Cru Gruyere King Cut Loaf Cheese, 6 Pound -- 2 per case.